The Canadog Deluxe walking/canicrossing belt was the first belt I got for canicrossing and I still use it many years on, both for walking and to loan to people who come canicrossing with me. I thought I would write a bit about it following on from the blog on how to choose your belt. The Canadog belt currently comes in a choice of three colours (red, blue and black) which appealed to me, along with the built in pocket large enough for a phone and keys, plus the water bottle holder at the back and a ring either side to clip a treat or poo bag to. 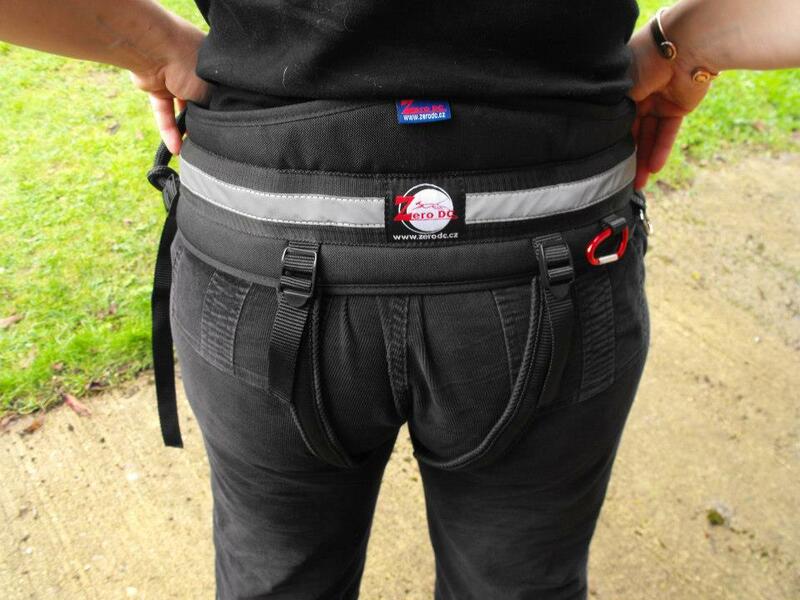 It is also very adjustable so can fit a wide range of people and suits all sorts of shapes and sizes. 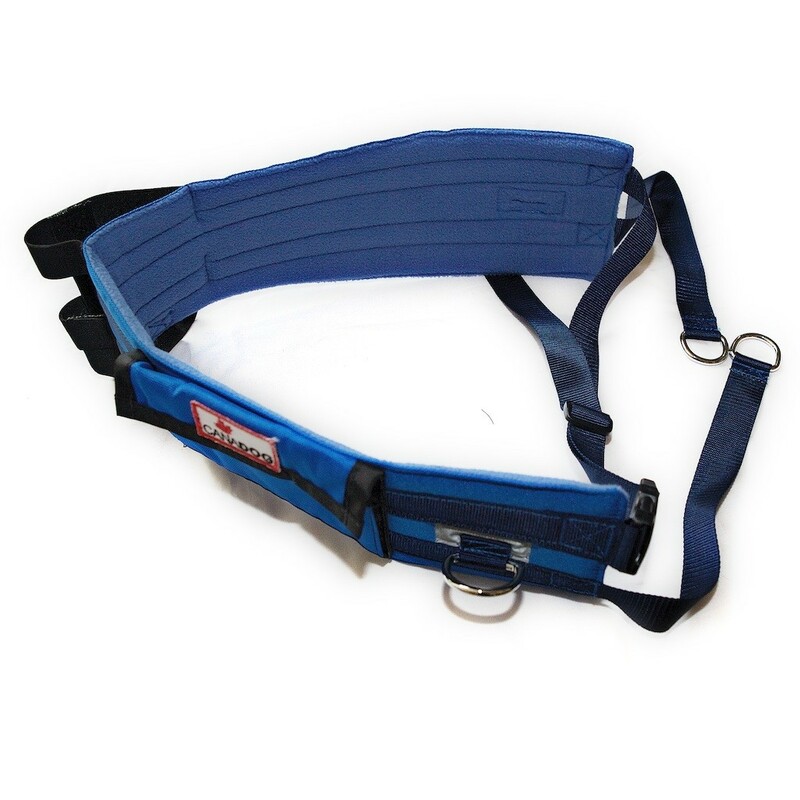 The belt is wide, fully padded and fleece lined for the runner or walkers’ comfort, as the pull from the dog is absorbed through the belt without putting any pressure on the runners back. The bungee line (sold separately) is attached via the two d-rings at the front of the belt and you will either need a caribiner or a line with a clip at each end to provide an element of quick release, otherwise you can usually just loop the end of the line through the d-rings. As I explained in my previous article, I think the Canadog belt will suit a wide range of people but can rise up the waist if you wear it lower down (as I do), have a much smaller waist than hips and your dog pulls very hard. I think this is its’ only disadvantage for use when canicrossing. I’ve been asked a lot about canicross waistbelts recently, which one do I think is most suitable and which one is the best? There are so many new options coming onto the market, it’s hard to know just from the descriptions which belt does what. 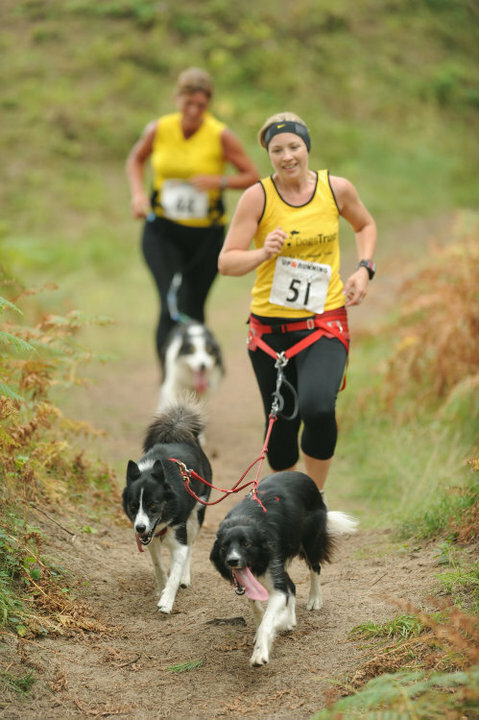 My answer is the same as with the dog harnesses, because everyone is an individual, I believe that certain canicross belts will suit certain people but not others. This makes it difficult to advise people on the perfect belt for them, however I can offer a few things to think about when choosing a belt that may help you decide for yourself which will be the right option for you. 1 – Where do you want the pull to come from? 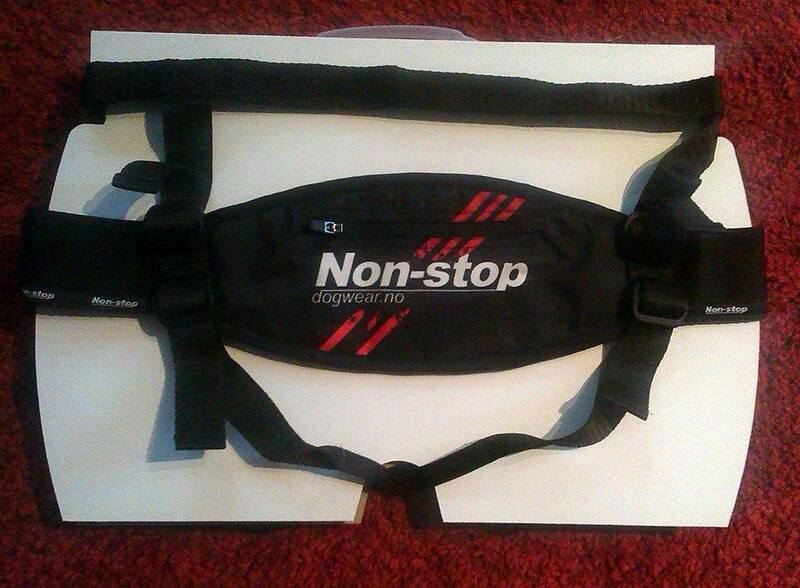 2 – Do you want leg straps? Closely connected with – does your dog pull you very hard? If your dog pulls hard out in front of you, the chances are that any belt you will try, will ride up on your waist and into the small of your back unless you have leg straps. The exception to this seems to be in people who have a less defined waistline and (without being rude!) a more ‘H’ shaped body than an ‘A’ shaped body, the belts seem to ride up more where the waist tapers in. This canicross/walking belt (no leg straps) as you can see does rise up on me with two dogs attached, which is why I prefer leg straps and wear the belts lower down on the hips. 3. How much padding do you want? Another thing you may want to consider is the amount of padding you would like in the waistband of your belt. More padding can make the belt much more comfortable but can also add to the weight of the belt and when you are running in the spring and summer months or longer distances, this might be something to think about carefully. A more padded waist belt in action, but pulled low on the hips this time. 4. Will you be racing in the belt? 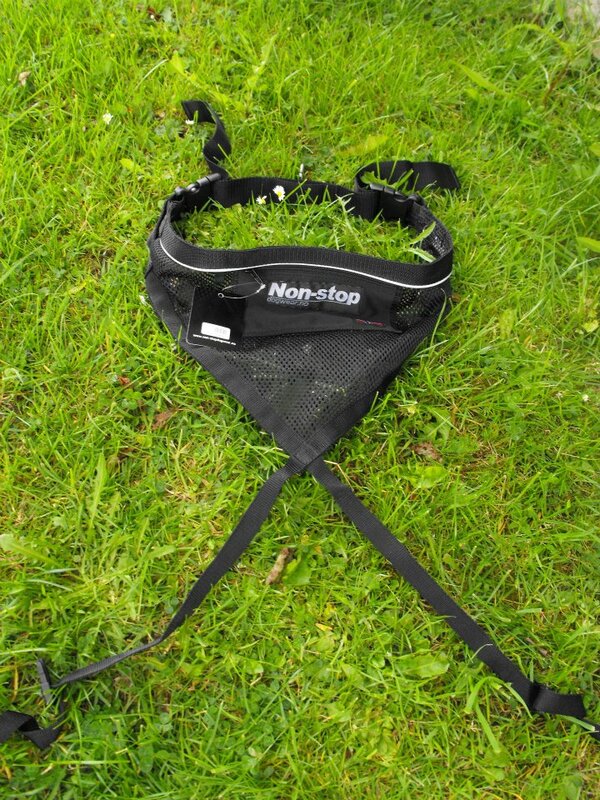 One of the lightest belts on the market is the Running Belt from Non-stop, which has been designed by the top professional canicrossers in Europe to provide a lightweight racing belt that can comfortably cope with the pull of a very strong dog. I have switched to this belt for racing as it is exceptional in it’s ability to distribute pull and has even managed to incorporate a pocket! 5. Do you need pockets? Another consideration is if you need storage in your belt for keys, a mobile phone or poo bags when you’re running. The belts with pockets are the Non-Stop Running & Comfort Belts, The Zero DC Canicross & ‘Speedy’ Belts and the Neewa Canicross & Trekking Belts. 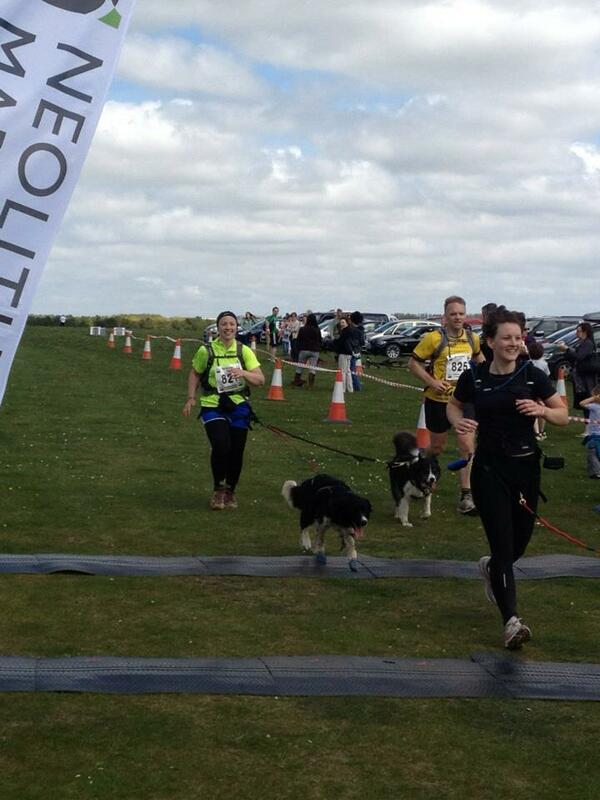 The Neolithic Half Marathon, organised by Wiltshire Wildlife Trust in conjunction with CaniX (for the canicross entries in the race) was held over the bank holiday weekend on the 5th May at the site of Stonehenge. We’d entered the short race before, which is the 4 miles distance, but the half marathon had not been something I had wanted to do. 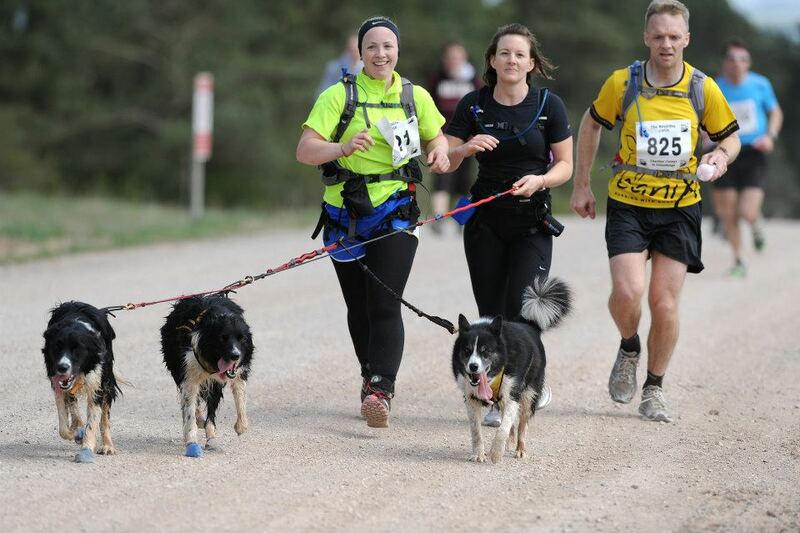 The reason I decided to enter the longer distance this year was to raise money for the Animal Health Trust in memory of my friends’ dog Ronnie who died from canine epilepsy earlier in the spring. We arrived early to register, collect our time chipped numbers and to catch the coach up to Charlton Clumps, where the 13 mile linear route starts. The dogs are surprisingly good on the coaches that take competitors to their start points and very rarely cause any problems. This bus journey was a bit longer than the ones we had previously taken but the dogs behaved just as well. On arriving at Charlton Clumps there was a tent to leave any bags to be labelled and taken back to the start and a couple of portaloos, as we had about an hour to wait before our start time in an open field. There were 4 of us who were ‘Running for Ronnie’ and we all had different targets for the run. Mine was to finish in under 2 and a half hours for my first half marathon and I had a feeling we were going to have to take it steady as the temperature was creeping up steadily. Just as we were about to start, the cloud cover disappeared and the sun came beaming through, just what I didn’t want for the dogs! The route for the half marathon is a hard packed trail with lots of loose stones, particularly on the first half. The track also undulates with some fairly steep uphill and downhill sections for the first half, after which it levels out and becomes less stony. I had been pre-warned about the stones and so I had Judo in a full set of Pawz boots and Donnie with just front feet protected (Tegan doesn’t need boots for regular running). We set off at a steady pace but with the heat of the sun and with the ‘race’ situation, it became clear quite quickly that Judo was beginning to get too hot. We slowed down and at every water stop covered him and the other dogs lightly in water to help with the cooling process. Dogs tend to lose heat through panting and to a lesser extent their paws, so it was important to keep checking the boots weren’t going to cause any overheating. After about 3 miles we made the decision just to walk until Judo realised we weren’t racing and calmed down. I’ve experienced Judo verging on getting too hot a few times, always in situations where he sets off with a big group of dogs and is very excited. Through this I have learned how to manage it so he never gets uncomfortable and thankfully it wasn’t long before he was calm and cool again and we could pick up the pace. We had probably walked about a mile and a half at this point but we made up some time and it wasn’t long until we reached the half way point. From this point on the run seemed to go really quickly and in spite of it being warm, the dogs dutifully pulled all the way. It did help that the ground had evened out both in terms of stones and hills so it became easier for us all. With 4 miles to go, I recognised where the shorter race is started from and realised it wasn’t far to go. We were running along at an average of about 9 and a half minutes per mile so I was hopeful of completing within my time frame in spite of the walking we had done. With about 2 miles to the finish I started to feel strange and realised I had goose bumps which was not normal considering the heat and that fact I was running! I asked one of my running companions why that might be and he asked if I had been drinking. I had been so busy making sure the dogs were kept cool and hydrated that I had forgotten to drink myself! I had to slow to a walk again and take some water and electrolytes to make sure I replaced all the water and salt I would have sweated out. After a short break from running I was able to pick up the pace again for the last mile and we had a strong finish completing the half marathon in 2 hours, 19 minutes and 3 seconds. I was thrilled we had managed to complete within my goal and that was even with a couple of miles of walking and many, many water stops. Crossing the finish with smiles on our faces! I would highly recommend this half marathon to anyone thinking of training up to this mileage or anyone who is already running this type of distance with their dog. 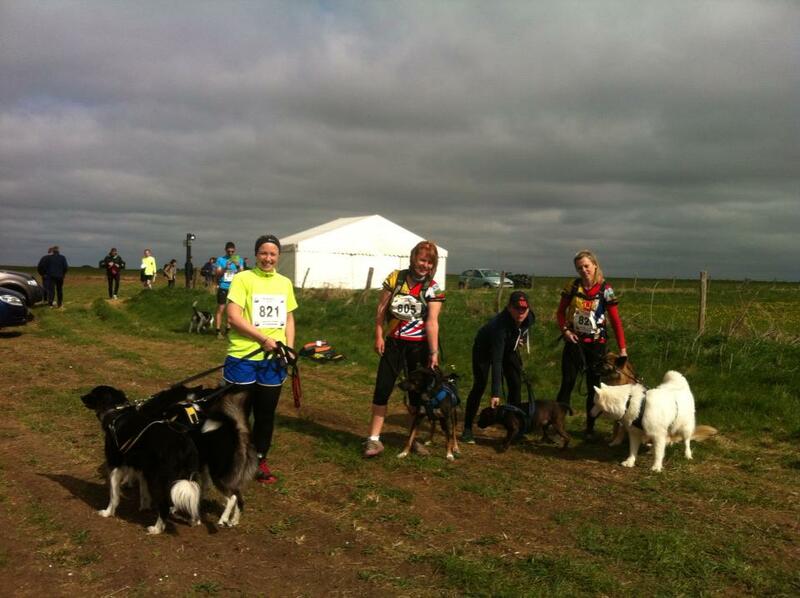 The support along the way was incredible, from other runners and bikers (this a big event not just for canicrossers) and from CaniX who were at regular points along the course with water and a hose for the dogs (and people). At any point it would have been simple to withdraw your dog and the dogs’ welfare was paramount at all times. 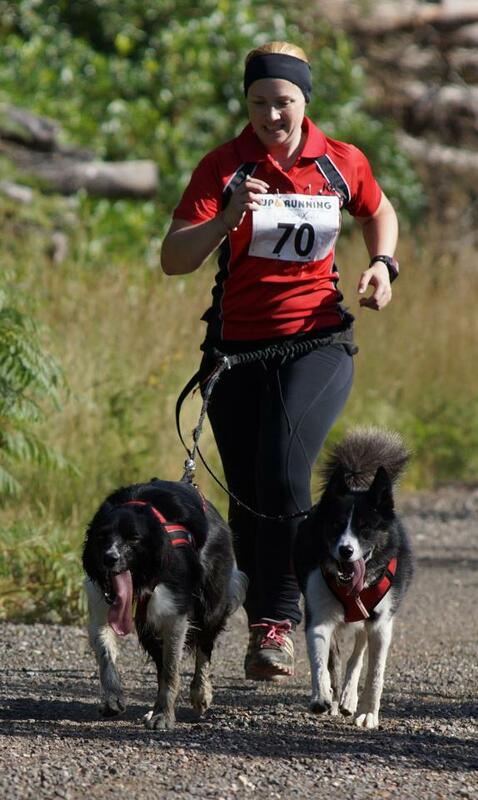 I think this event is unique because of the support CaniX provides and so I am grateful to them for putting this event in the race calender for us to challenge ourselves. 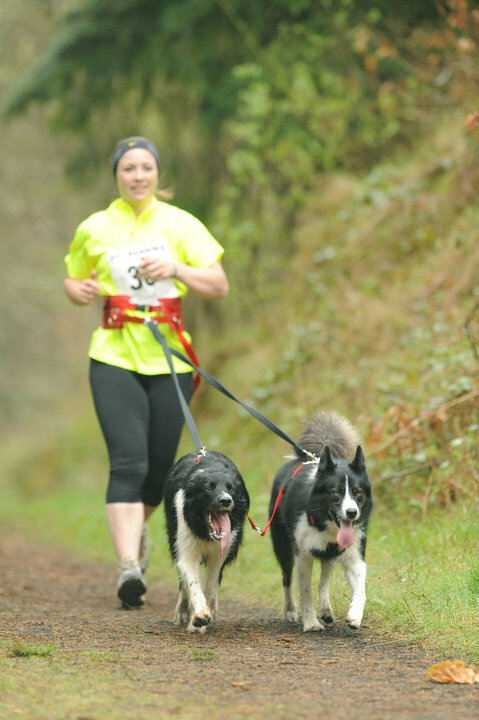 There are now so many lines for running with your dog available, it’s hard to know which one to go for, so I thought I’d write a little bit about the types and my own experiences of which works best for me in which situation. However, the Howling Dog Alaska Line is quite long and some people find it too long if their dog is new to the pulling sports and doesn’t always pull out in front. Our best selling lines also made of webbing, which is softer on the hands, are the Arctic Wolf lines, also available in a variety of lengths to suit your needs and with an integrated grab handle near the clip which attaches to your dog. 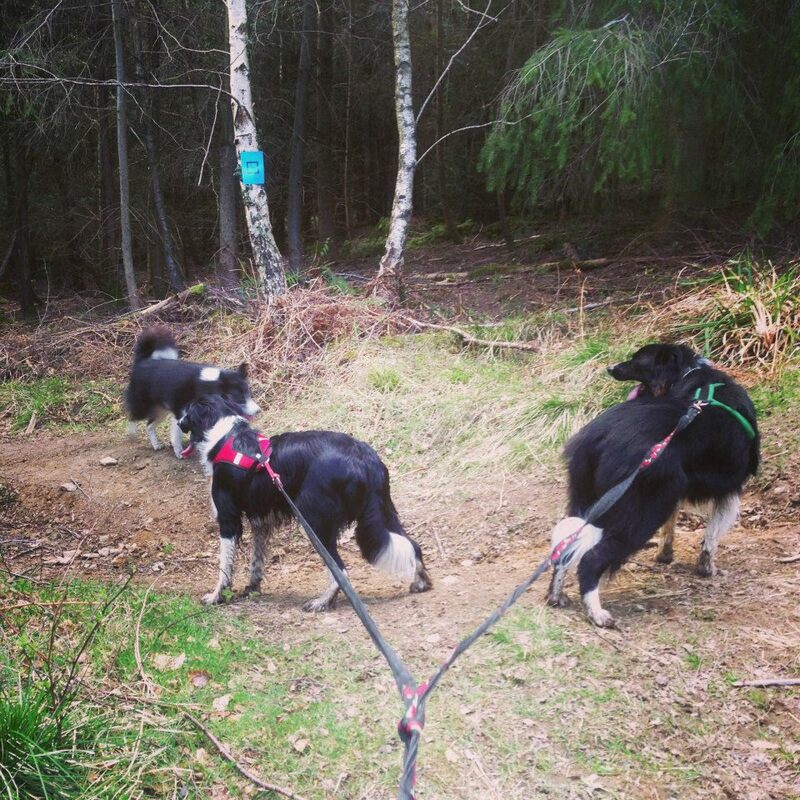 One of my favourite lines in my collection of lines and one of the most useful is the Bono’s Canicross/Walking Line (http://www.k9trailtime.com/shop/bono-canicross-walking-line.html) I introduced this line to the K9 Trail Time range as a result of some complaints at Parkruns that other runners were finding the canicrossers lines a trip hazard. 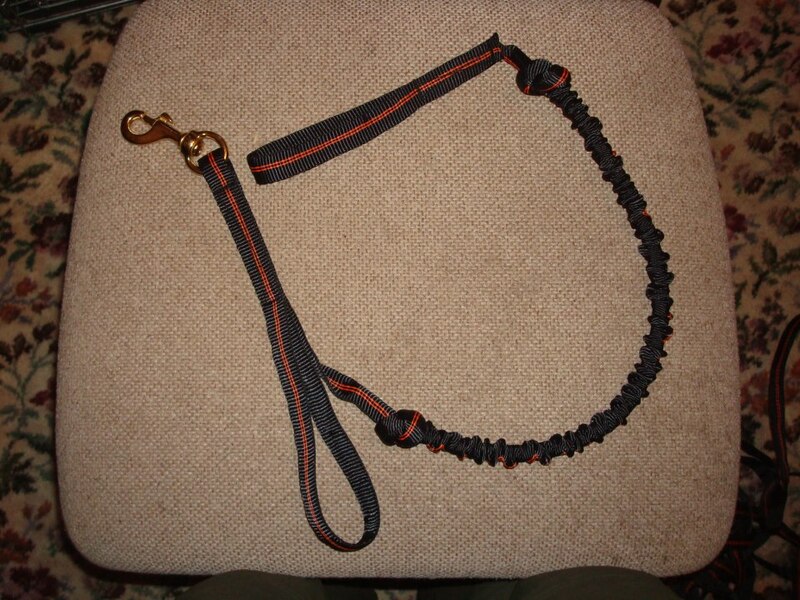 The line is much shorter than a normal canicross line and keeps your dog really close to you, it also has a handy grab handle on the outside of the line near to where it attaches to your dog for greater control when needed, for example by roads. It is also suitable for normal dog walking but not long enough for bikejor or scootering. As you can see there is quite a choice available to you and if you would like any more advice or information on any of the Lines I use and sell at K9 Trail Time, please do not hesitate to contact me (emilyt@k9trailtime.com) and I would happy to help. 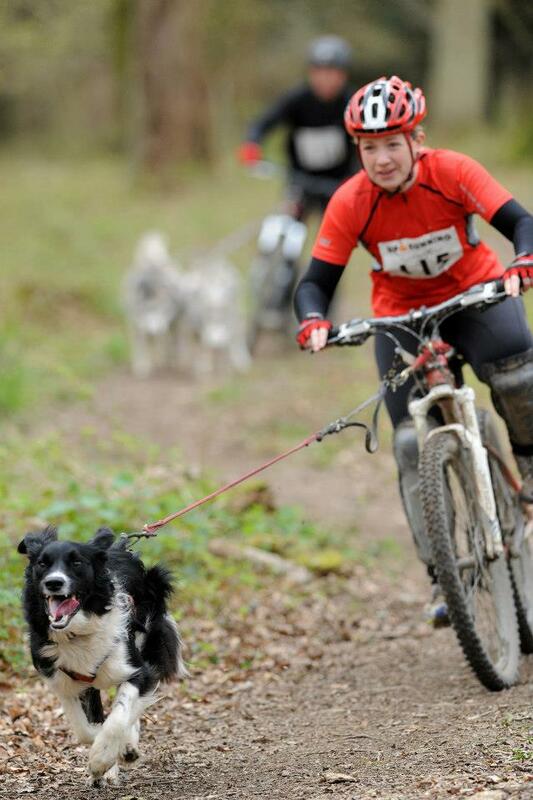 The Bracelands CaniX races were held over the weekend of the 27th & 28th of April in the Forest of Dean, based from the Bracelands Adventure Centre which provided the camping for the event and also a lovely little cafe with facilities for the day visitors too. I missed the event held here last year and so I was looking forward to seeing the technical bikejor course everyone had told me about. The weather leading up to the event had been dry and so the mud that was experienced for the last races was only present in a few places, where the hills dipped down into large ruts which still held water. A sign at the CaniX van warned all the bikejor and scooter competitiors to walk or ride the course first (without dog) to ensure you had seen the course before bikejoring or scootering, as some forestry work had left big trenches which could’ve proved tricky for the wheeled vehicles at any speed. I decided to walk the dogs around the course on the Friday evening so I knew what I was in for and I took a picture or two of the hazards for reference to remind myself what to expect. Saturday morning we were raring to go on the bike and with a fast single track down hill start, it was definitely a start to hold on tight with. Donnie raced down the start chute through the trees and down to the first marshal point where the course turned left onto a wide, hard packed forest track. The course took you along the top of the valley, before the next marshal point and a right turn into the more technical section on the course. From this point it was mainly downhill through the trees on rutted trails which had dried out from being muddy into some quite tricky sections to negotiate on the bike or scooter. We seemed to fly through most of it and Donnie took all the lines I wanted to take without me even giving voice commands, he seemed to read my mind for most of it. A few people came off down one particular section (the top of which is pictured above) where a sharp left turn took you down a steep section with boulders and roots to avoid. At the bottom of this hill and after a right hand turn the track widened out again but had some large water-filled ruts to ride through and then began the uphill climb. At first there was a short slope followed by another fast downhill but then with a right hand turn you were back out onto a hard packed forestry road which climbed up and up and up and up! I had to get off the bike in the end, as it was quicker and easier for poor little Donnie for me to get off and run. By the time I got to the top we were both ready to race off up the track towards home again and it was a nice easy ride into the finish chute, albeit slightly uphill most of the way. We finished fairly strongly in third place and I was thrilled we had completed the course without any tumbles. Sunday was much the same with us shaving a few seconds off our time and retaining our third place for the weekend and securing us a third place in the CaniX UK bikejor championship. In conclusion I would say the Bracelands course is probably not for the beginner bikejorer or canicrosser due to the challenging downhill sections and the long, tiring uphill. I think if I hadn’t done quite a bit of extra training on the scooter recently, Donnie would have been quite tired, as the course was also longer than the standard 5km at around 6km. I personally loved it as the concluding bikejor race in the 2012/2013 season but have to acknowledge it was a tough course too.